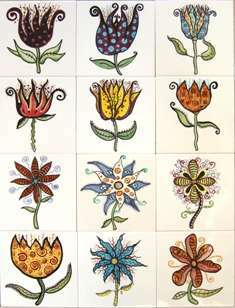 We were charmed when we found these funky flower designs by a wonderful artist in Ohio. 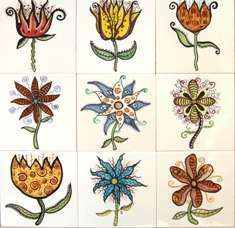 Luckily Bridgit D Ginley was delighted when we suggested using her designs for this set of hand painted single decor tiles. Hand painted and digitally printed versions are available. Go here for more on Bridget's work.